A couple weeks ago, we ran a poll asking you if you feel FeedBurner has a future at Google. We asked because there is and was a lot of concern around FeedBurner's future. There are signs that Google may indeed shut it down and honestly, if they do, I'd be pretty upset. Why? Because I use them and use it heavily even before Google acquired them. 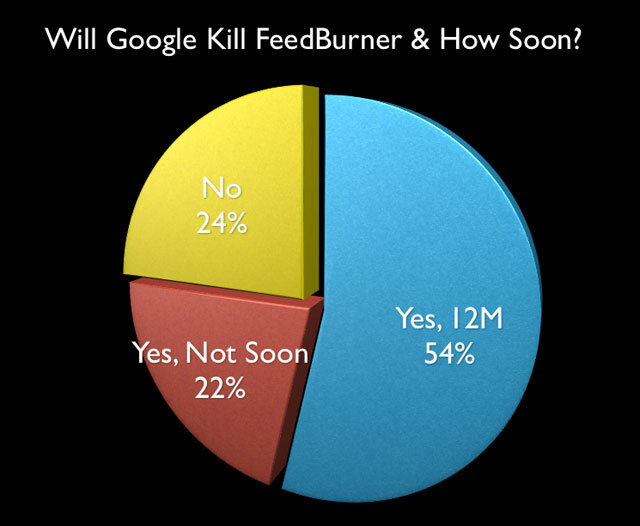 That being said, we have over 150 responses on our poll asking "Will Google Kill FeedBurner & How Soon?" Wow, 54% of the folks who responded think FeedBurner will not only die but also die within 12 months! I hope not.